A severe weather outbreak is going to unfold from east Texas into the lower Mississippi Valley tomorrow. The threat will then shift into the Southeast, and even points north, on Sunday. Widespread storms are expected to form across east Texas and west Louisiana by early afternoon. A squall line will then form by the evening, most likely over either west or central Louisiana, and track through the remainder of Louisiana and into Mississippi. Some supercells will be likely with storm initiation tomorrow afternoon, as well as ahead of the squall line. With CAPE values forecast to rise to between 1000 and 2000 j/Kg, a strong southerly/southeasterly low-level jet, and strong southwest/south-southwest winds at 500 mb, numerous severe storms will be likely. The Storm Prediction Center (SPC) has now outlined a level 4 (out of 5) MODERATE risk area for northeast Texas, north Louisiana, south Arkansas, and part of west-central Mississippi. Several tornadoes are likely, along with large hail and damaging wind gusts. Models are predicting high significant tornado parameter (STP) values late tomorrow afternoon (see figure 1), suggesting that a few tornadoes could be strong and/or violent. A strong squall line will track across Alabama and the Florida Panhandle during the morning hours. CAPE will drop slightly, but remain sufficient for strong/severe storms. Values will range from 500 – 1500 j/Kg. The strong low-level jet and mid-level (500 mb) winds will also overspread the Southeast. This will continue the threat for severe weather. 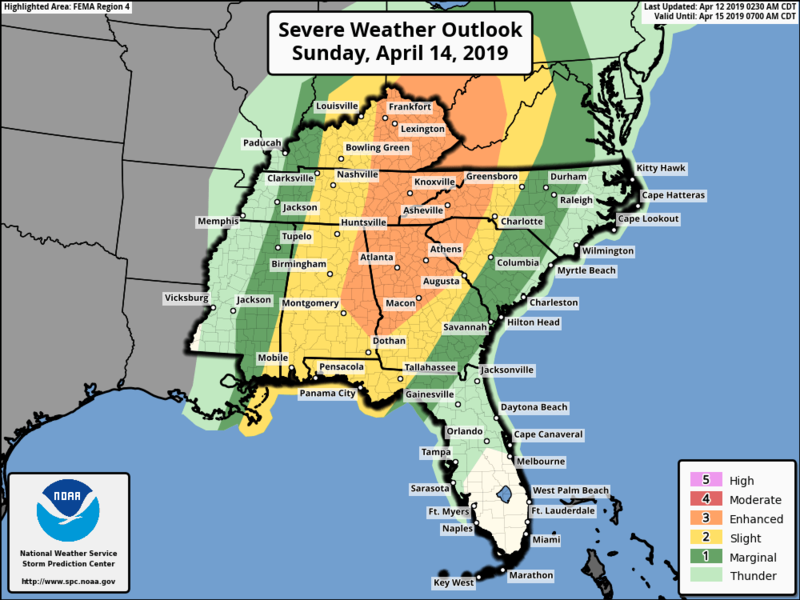 The SPC has hatched an level 3 out of 5 enhanced risk area for a small portion of east Alabama into the Appalachians and Ohio Valley. Much of Alabama and the Florida Panhandle are included in a standard, level 2 slight risk. However, this could change. With the main convective mode becoming linear since we are talking about a squall line, the main threat will be damaging wind gusts with bowing segments. A few embedded tornadoes will also be possible though. Storms this weekend will produce periods of heavy rain. A general 1 -2″ if expected. However, these storms should be fast moving. Therefore, there shouldn’t be any major flooding issues outside of nuisance type flooding. If you live in a mobile/manufacture home in either the enhanced or moderate risk area, you might want to consider locating an alternative place (such as with a family member, friend, etc.) to spend the afternoon/night tomorrow if possible.